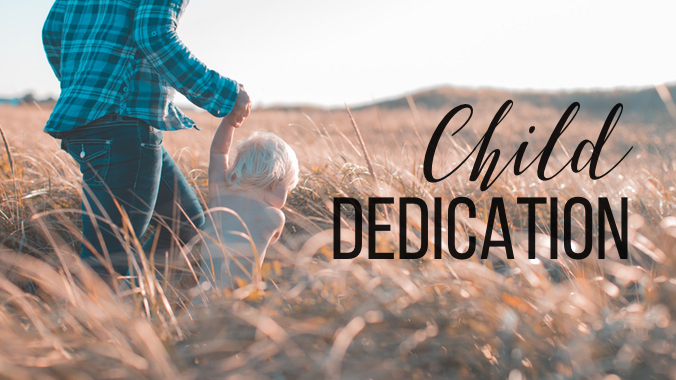 Interested in having your child dedicated? We have baby dedications to allow parents the opportunity to publicly join in a covenant with God, their children and our church family. Baby dedications are essentially committing yourself as parents to follow Jesus, to model the Christian life and shepherd their children to know and love Jesus. Baby dedications should not be viewed as a replacement for baptism - we pray your children will develop a relationship with Christ and, at some point, choose to get baptized. Nor is it a magical means of salvation/protection for your child. Baby dedication is simply an outward act of the parents' inward commitment. Please fill out the below form and choose a Sunday at least 2 weeks before the dedication to meet with James Rey our Family Pastor to review the dedication process. You will recive an email confiming both the dedication data and the pre-dedication meeting. Is there any family or friends you would like to have on stage during the dedication? Is there a specific scripture verse that is special to you for your child(ren)? Do you have a specific prayer request for your child(ren)? Do you have a specific prayer request for yourself/spouse as parents? Please choose a date and time at least 2 weeks prior to the dedication and indicate the date and time in this box. The meeting will last 15 minutes and you can choose from Sunday at 10:45am or Sunday at 12:45pm. 1. Dedicating ones child is based on a scriptural precedent, rooted in the Old Testament, in which Jesus was presented to the Lord in the Temple as an infant (Luke 2:22-35). 2. It acknowledges God’s blessing upon and care for children (Isaiah 54:13; Matt 18:1-5, 10; 19:13-15; Luke 18:15-17; Acts 2:39; 1 John 2:12-13). 3. It’s you, Parents, who are doing the dedicating. It’s a commitment you make in your heart before God and agree together to live out in your home. The dedication we perform during the church service is simply the public acknowledgment of your commitment. 4. You’re publicly acknowledging that your children are a gift given to you by God (Gen 33:5; Psalm 127:3-5). As such, they’re a blessing, a source of great joy (Prov. 23:24-25), and a great privilege –aside from being a lot of work too! Ultimately we recognize they’ve been created by God, and as such belong to him, yet have been entrusted to you as stewards to raise. (Exodus 13:2, 12). 5. You’re committing your lives as parents to live by the grace of God in such a way as to be an example of those who honestly and transparently follow Jesus, while avoiding the placement of any stumbling-blocks in their way. 6. Your church family and leadership commits to support and equip you by God’s grace to fulfill your responsibility as good examples to your children.